I was sitting in a group of colleagues recently, and we were challenged to remember our favorite Valentine’s Day memory. One person in the group sourly remarked that he doesn’t observe the day, because “it’s a made-up holiday.” I didn’t get the chance to ask him what he would consider a “real” holiday. Mother’s Day? That one was started in the 20th century, and its founder sharply criticized the commercial apparatus of Mother’s Day cards and chocolates that grew up around it. I wonder what the founder of Christmas must think of us. Nowadays, St. Valentine’s Day (to give it its proper name) is just one more of the secularized holidays that has its roots in Catholic tradition, like Veteran’s Day (the feast of St. Martin of Tours), Halloween (the eve of the Feast of All Saints, formerly known as the Feast of All Hallows), and of course Mardi Gras, which unfortunately has become just an excuse to indulge the flesh, not a consolation prior to its Lenten chastisement. Like all these holidays, St. Valentine’s Day has deep roots. We know little about the Valentine, or possibly Valentines, who inspire us every February to loving thoughts of perhaps a more exclusive nature than those prescribed by the Gospels. A priest and a bishop from Second Century Rome are mentioned in early records. Both died as martyrs, and February 14 was established as the memorial. 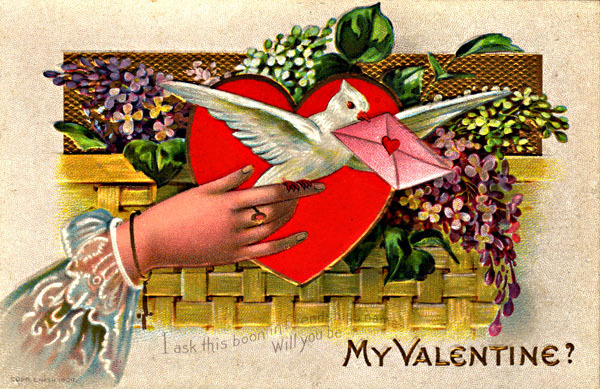 Delightful stories of dubious historical value are told about Valentine – that he helped Roman soldiers marry in secret, that he was briefly befriended by his persecutor, Emperor Claudius II, and that he cured the jailor’s daughter of blindness. French and English poets of the High Middle Ages wrote that birds began to choose mates in mid-February, and so we find the date associated with romantic loves. Bad-tempered debunkers of Christianity say the Church stole it from a pagan fertility festival. Well, where did the pagans get it? The early Christians didn’t invent festivals, or fertility, but they were the first people in the world to figure out what they were made for. In the days before household calendars, frequent festivals used to help people keep track of the turning of the year. This matters, not just for practical reasons, like planting, harvesting, and checking the anti-freeze, but because a reflective person remembers the curious dual infinities of time: it keeps moving on, yet it circles back and repeats. The holidays, anniversaries and birthdays recede from us into unattainable distances, but they return. And what do we do on the return of old friends? We have a party, which is why there are so many feast days in the liturgical calendar. People in the High Middle Ages noted the arrival of feasts, and, with that brilliant medieval sense of balance and proportion, took the day off from work. I don’t doubt that this helped them to manage stress. Maybe that’s where we’ve gone wrong. We’ve gotten much too serious about our traditions. We’re so serious we have eliminated most of them, because they don’t measure up to some oppressively serious standard of validity. The turgid atheism that compels people to file lawsuits when students pray in school is, in my mind, somehow akin to the grim religiosity that prompts people to condemn Harry Potter books and wring their hands over pumpkin carving. If we were a little more playful, a little more medieval, we might remember that the world is full of things that are not particularly good or bad in themselves. But they do present us with the opportunity to make a good use or a bad use of them. So gaze into the eyes of your special someone, spout a few lines of Chaucer, and deliver a heartfelt kiss. Repeat annually, or more often as needed. Happy St. Valentine’s Day. This entry was posted in Uncategorized and tagged Holidays, Valentine’s Day. Will you be *my *Valentine?